Ten years ago, I’d had a few kitesurfing lessons in the UK, bought two kites and a board and headed off around the world to perfect my kiting. Ten years on we are currently in Boa Vista, Cape Verde and I realised that some of the items I had on that first kitesurifng adventure still travel with me today. One such item is the PacSafe. 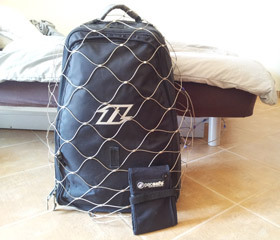 This genius invention has gone from protecting my small travel rucksack all those years ago to locking down kites to a scooter wheel in remote spots. We all travel with more and more electronics these days, with a lot of us needing to work on the go, and although replacable they are a costly loss. The PacSafe did and still does give me peace of mind every time we leave an apartment or hotel room, knowing that all our valuables are locked away and tethered down, so that any opportunist cannot just grab and run! The King of The Air competition last was held 7 years ago and it was where a young Ruben Lenten started to shine, right beside older kitesurfing stars such as Robbie Naish. Around 5,000 spectators gathered at this years event in Cape Town to witness many of the world’s best kiteboarders in action and even Robbie Naish came to witness it. Watch this amazing video highlighting the best moments of the competition.